September | 2016 | Mothers Against Wind Turbines Inc.
TORONTO, Sept. 29, 2016 – The Standing Committee on Justice Policy will meet to consider Bill 13, An Act in respect of the cost of electricity. The Committee intends to hold public hearings in Toronto on Monday, October 3, 2016. Interested people who wish to be considered to make an oral presentation on Bill 13 should provide their contact name, mailing address, phone number, and email address to the Clerk of the Committee by 3:00 p.m. on Friday, September 30, 2016. Those who do not wish to make an oral presentation but wish to comment on the Bill may send a written submission to the Clerk of the Committee at the address below by 6:00 p.m. on Monday, October 3, 2016. The Ontario Rebate for Electricity Consumers Act, 2016authorizes financial assistance for certain Ontario electricity consumers in respect of electricity costs. Consumers receive the financial assistance by means of an 8 per cent reduction in the amount payable before tax under their electricity accounts for each billing period. The amount of financial assistance for a billing period is required to be shown on invoices issued to consumers for the billing period. The Act authorizes the making of regulations to reimburse electricity vendors for amounts credited to consumers’ accounts under the Act. The Act authorizes the making of various other regulations, including to set out other ways for consumers to receive financial assistance, to alter the default rules in the Act for how to calculate the financial assistance and to limit or alter who is entitled to financial assistance. The Act contains administrative and enforcement provisions, including requirements relating to record keeping by electricity vendors and authorization for inspections and inquiries with respect to amounts of financial assistance provided and reimbursements to electricity vendors. The Ontario Energy Board Act, 1998 is amended so that provisions of the Ontario Rebate for Electricity Consumers Act, 2016 and regulations made under it will be enforceable by the Ontario Energy Board. Adverse Health Effects, Cost Benefit, Direct Effects, Green Energy, Unite the Fight! 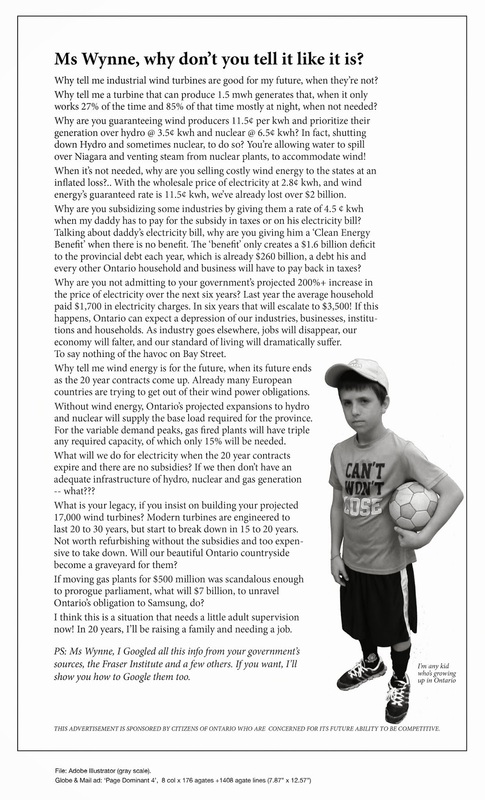 Energy Poverty is a direct serious harm to health that has resulted from Ontario’s energy policies. Poverty determines your level of health. Not being able to pay your hydro bill is an adverse health outcome resulting from the pursuit of renewable energy projects without careful consideration of benefits and costs. The Green Energy Act and rates paid for renewable energy (wind & solar) generated electricity has fueled the crisis of soaring hydro rates. There is a growing fury among those who can no longer bear such political agendas. The pressure is building. People are demanding Government serve people, not only the interests of the “green” industries. A rally against oppressive hydro bills attracted at least 100 protesters in front of city hall, and enough supportive horn honking on Main Street to sometimes drown-out speakers assailing Premier Kathleen Wynne’s government. Most notable were those mobilized enough by the issue to get downtown by 5 p.m. and who have never publicly protested anything before. Home electricity bills have skyrocketed in the last five years: off-peak prices have increased 47 per cent, and on-peak prices have increased 67 per cent. That’s why Lori Balkom took part in her first protest, holding a sign standing close enough to the road to feel the breeze from cars driving by honking. Her sisters Debbie Leblanc and Patti Glenn joined her. Leblanc lives in a building for seniors, and said at least one woman couldn’t afford to turn on air conditioning this summer and had to hang out in a mall instead. Jeff Coe happened upon the protest while out for a walk and was swept up in it and signed a petition. The focus of the rally was Wynne: signs called on her to resign, and labelled her government “corrupt or stupid.” The most popular read: “Keep hydro public,” a reference to calls for Wynne to reverse the privatization of Hydro One, the province’s electricity transmission monopoly. Politicians from the provincial Progressive Conservatives and NDP spoke, but the rally’s organizer, Sarah Warry-Poljanski, was the focal point, dressed in work boots, bright orange hydro worker-style coveralls, and white hard hat. Nowhere else in Ontario would a temporary cement plant be permitted by a public school. Please ask Minister Murray (minister.moe@ontario.ca) and Premier Wynne (premier@ontario.ca) to revoke the Renewable Energy Approval for turbines on Amherst Island. I am the mother of two daughters (ages 7 and 10) who attend Amherst Island Public School. I was a Participant in the Environmental Review Tribunal (ERT) regarding the above issue. The panel dismissed my concerns regarding the siting of the cement batch plant, and my belief that the safety of children in their school environment will be compromised.I am formally requesting that you reverse the ERT decision based on my belief that the placement of the concrete batching plant and all associated construction activity for this project directly adjacent to the school will result in harm to children. 1. The cumulative impacts on children of all the construction activities that this project introduces have not been adequately considered, in particular the impacts to Amherst Island Public School.- The evidence presented by the Approval Holder at the ERT broke down the project into detailed, individual activities, whose negative impacts are deemed to be negligible.But the ERT omitted to consider any examination of collective impacts to children.- Because each activity was looked at in isolation and not with an integrated approach, the potential harm of the project’s cumulative impacts has been overlooked. It remains my opinion that the Director of Environmental Approvals did not adequately consider the cumulative nature of the concrete batch plant and activities and the impacts to the health and safety of students. Given that the concrete batching plant and associated construction for this project will occur less than 1 km from our elementary school, it actually appears that the single group who stands to experience the most negative effects from this project will likely be the children attending Amherst Island Public School. 2. It is unclear who is responsible for safety associated with this project. It is still unclear who is responsible for safety and oversight in relation to the school environment. During the ERT, I learned that there would be extensive construction traffic from this project passing by our school, in addition to a concrete batching plant in proximity to the school that would not be allowed by our municipality if not for the Green Energy Act. 3. The “Burden of Proof” required by the ERT can only be accomplished by exposing children to unacceptable risk. The UN Convention on the Rights of Children is clear: Governments have a responsibility to protect children. The best interest of the child shall be a primary consideration in government decisions. I believe that by approving the project, the Director has authorized the Developer to introduce plausible harm to children.- The ERT found that during my submissions, I had not met “the test” of serious harm to human health. In the case of Amherst Island, to provide undeniable “proof” that the health of children will be impacted by the project would mean allowing the project to move forward as approved, and then assessing outcomes to children after months of exposure. In Canada, in 2016, we do not permit such trials on children. However, that is threshold of the “legal test” that must be attained in order to successfully defend my children. We must be reasonable, and consider the Precautionary Principle, which states that when risk of harm is scientifically plausible, actions should be taken to avoid or diminish the harm, and these actions are interventions that are undertaken before harm occurs. Amherst Island is close to 16 Km long. Why did the Director not ask the Approval Holder to find a different location for the cement plant? Why weren’t these concerns noted in the ERT decision? Minister Murray, if this project is allowed to move forward as approved, without adequate assessment of the cumulative impacts to the Amherst Island school environment, then our children become the test to see if the decisions of the Director were right or were wrong. All children deserve better. In order to support the health, safety and welfare of children attending a public school in Ontario, I would respectfully request that you reverse the ERT decision in relation to the placement of the concrete batch plant for this project, and amend the conditions related to the concrete batch plant. In the words of Dalton McGuinty “It’s never too late to do the right thing”. Amherst Island Public School. No place for a cement mixing plant. Municipalities across Ontario are cheering the government’s decision to suspend its competition for 1,000 megawatts’ worth of big, new renewable energy projects. But one industry association representing companies that were preparing to try to snag a contract is shocked at the sudden shift in the winds at Queen’s Park. Ontario’s energy minister said Tuesday there simply isn’t the demand for power to go ahead with its second round of procurement. Instead, it can save $3.8 billion in costs related to the electricity system and save residents $2.45 a month on their electricity bills, Thibeault said. In the rural township of North Frontenac, Mayor Ron Higgins’s phone was ringing off the hook after the surprise announcement. His township’s council was the first to pass a motion earlier this year demanding that any new project receive municipal approval in order to get the province’s green light. A one-time wind farm proposed for an area along the highway to Bon Echo Provincial Park had caused his residents much angst in recent years, said Higgins. After North Frontenac passed its resolution motion in March, more than 100 other municipalities followed with resolutions of their own, and pressure mounted this summer at a meeting of Ontario municipalities. Still, Higgins only expected to have more input in the next request for proposals. “But it caught me off guard. I wasn’t expecting them to cancel it outright at this point,” said Higgins. But not everyone was thrilled. “We were extremely disappointed and shocked by the decision,” said Robert Hornung, president of the Canadian Wind Energy Association, which represents project developers, wind turbine owners, manufacturers and others in the industry. Ontario will immediately suspend the second round of its Large Renewable Procurement (LRP II) process and the Energy-from-Waste Standard Offer Program, halting procurement of over 1,000 megawatts (MW) of solar, wind, hydroelectric, bioenergy and energy from waste projects. This decision is expected to save up to $3.8 billion in electricity system costs relative to Ontario’s 2013 Long-Term Energy Plan (LTEP) forecast. This would save the typical residential electricity consumer an average of approximately $2.45 per month on their electricity bill, relative to previous forecasts. No additional greenhouse gas emissions are being added to the electricity grid. On September 1, 2016, the Independent Electricity System Operator (IESO) provided the Minister of Energy with the Ontario Planning Outlook, an independent report analyzing a variety of planning scenarios for the future of Ontario’s energy system. The IESO has advised that Ontario will benefit from a robust supply of electricity over the coming decade to meet projected demand. Informed by the Ontario Planning Outlook, consultations and engagements will begin this fall with consumers, businesses, energy stakeholders and Indigenous partners regarding the development of a new Long-Term Energy Plan, which is scheduled to be released in 2017. As part of this plan, Ontario remains committed to an affordable, clean and reliable electricity system, including renewables. Ontario has established itself as a North American leader in clean energy development, attracting billions of dollars in private sector investment and generating over 42,000 jobs in the clean technology sector. The province has about 18,000 MW of wind, solar, bioenergy and hydroelectric energy contracted or online and the electricity supply is now over 90 per cent emissions-free. Responsible management of Ontario’s electricity system is part of the government’s economic plan to build Ontario up and deliver on its number-one priority to grow the economy and create jobs. The four-part plan includes helping more people get and create the jobs of the future by expanding access to high-quality college and university education. The plan is making the largest investment in hospitals, schools, roads, bridges and transit in Ontario’s history and is investing in a low-carbon economy driven by innovative, high-growth, export-oriented businesses. The plan is also helping working Ontarians achieve a more secure retirement. Ontario’s new LTEP will be guided by a number of strategic themes including greenhouse gas reductions, innovation, grid modernization, conservation and energy efficiency, renewable energy, distributed energy and continued focus on energy affordability for homes and businesses. At the end of 2015, Ontario’s installed wind capacity represented almost 40 per cent of all installed wind capacity in Canada. Ontario is home to more than 99 per cent of all installed solar photovoltaic capacity in Canada. Ontario successfully eliminated coal-fired electricity generation in 2014, the single largest greenhouse gas emissions reduction action in North America. TORONTO – Ontario’s Liberal government denies Opposition charges that it interfered with the witness list for a hearing into a plan to install at least six, 152-metre-high wind turbines near the Collingwood airport. Progressive Conservative house leader Jim Wilson says the province decided at the last minute to call a witness from NAVCanada instead of an expert from Transport Canada at an Environmental Review Tribunal hearing. NAVCanada is a private corporation that owns and operates the country’s civil air navigation service, while Transport Canada is the federal government department responsible for transportation policies and programs. Wilson says the witnesses were changed because Transport Canada has concerns about putting industrial wind turbines between the Collingwood Regional Airport and the Stayner aerodrome. He says the Ontario government refuses to acknowledge that putting giant turbines so close to the small airports pose a hazard to aircraft operations. But Environment Minister Glen Murray says it would be against the law for him to play any role in determining witnesses or influencing the environmental tribunal. Over 1400 barge trips across the Amherst Island ferry path will be needed to transport all turbine parts, heavy haul trucks, cranes, a cement batching plant, materials, fuel, fuel trucks, and supplies from the mainland to Amherst Island. The potential for collision is exacerbated by the plan to undertake all construction from September to March. Two industrial docks, one on the mainland and one in Kerr Bay on the Island are proposed. A 4.6 km transmission cable laid by a specialized ship will follow the barge path and similarly intersect with the ferry route. This constant intersection of barges and ferry poses a multitude of risks for residents of the Island, all those using the ferry, and hundreds of recreational boaters. Hazardous materials transported by barge include dynamite, fuel trucks, diesel, gasoline, transmission and hydraulic fluids, anti-freeze, motor oil, cementitious materials, nacelles containing oil, turbine parts composed of over thirty different minerals, 300 heavy haul trucks and several cranes. Every barge trip will intersect with the ferry path to Amherst Island. Two barges will be used for transport: a 300-foot-long component barge and a 150-foot civil barge. A marine accident involving hazardous materials in the channel is an unacceptable risk. Loyalist Township documented their concerns with the proposed routes of the barge traffic and the submarine cable used to connect the transmission line to the mainland. Both routes cut across the ferry path. The Frontenac II ferry crosses the North Channel every 30 minutes from 6:00 am until 2:00 am between Millhaven and Stella and has right-of-way over all other marine traffic. It is impossible to exaggerate the importance of this right of the ferry to pass freely on its scheduled route: it is literally a lifeline for Island residents. An island offers no alternative routes for residents, commuters, suppliers, and most significantly, emergency vehicles. Most regular users of the ferry have encountered the situation in which the ferry, in mid crossing, makes a sudden course reversal, returning to the mainland to pick up an ambulance. Maneuverability and speed are essential, factors which would obviously be impeded by the presence of constant barge traffic crossing the ferry path. The barge traffic will also pose serious navigational hazards for the hundreds of recreational boaters in the waters north of the Island and impede access to several well-known safe anchorages on the Island’s north shore. The daily traffic from tugs with barges crossing the ferry route and entering Kerr Bay will create an unacceptable hazard in violation of the Navigable Waters Act. The ferry and the hundreds of other mariners in the waters off Amherst Island would have their right to safety threatened and, particularly for the recreational boaters, their access to safe anchorage or moorings impeded by the heavy volume of barge traffic. This hazardous situation is exacerbated by the fact that the barge traffic, unlike the scheduled ferry crossings, would be constant but irregular, increasing the risk of a marine collision. Windlectric has not provided the Marine Safety and Logistics Plan required in the MOECC Decision on Instrument for this project nor has it produced an Emergency Response and Communications Plan acceptable to Loyalist Township. Our entire community is at risk. Please ask Minister of the Environment Glen Murray (minister.moe@ontario.ca) to revoke approval of the Amherst Island Wind Project. Few Vermonters will defend wind turbines, so the national organization comes to the rescue. Go look at the American Wind Energy Association’s members: mostly large multinational corporations heavily invested in fossil fuel and nuclear. The industry’s global attitude of blaming the victims is offensive in the extreme. Abuse people once by making them sick and unable to sleep; abuse them again by telling everyone it’s all in their heads. Same story everywhere. At a Sept. 19 ribbon cutting in Searsburg, Governor Shumlin celebrated making people in the region sick and unable to sleep. He wants more Vermonters to suffer. Drought, hail storms, and low commodity prices sometimes made profit margins tight on our 160 acres. But growing up on that farm also taught me priceless values that sustained our family farming operation through thick and thin. A strong work ethic, resilient attitude, spirit of fair play, watching out for your neighbor, caring for the wildlife that shares our land, and being a good steward of the soil shaped this rural legacy of values passed on to me from my ancestors to whom I am forever indebted. Wind farms threaten this legacy. Wind farm corporations know this and work hard to incentivize farmers with promises of “free money,” avoiding the “Who owns the wind” question until it’s time to sign the contract. In the words of a fellow Iowan and respected writer, “They act as though eminent domain extends to the sky.” They control the script. They control the outcome. They control the strings. That’s why the “promise” of free money dominates the debate, overshadowing other urgent concerns. Who owns the soundscape we all listen to? Who owns the horizon we peer into day and night? Who owns the wildlife that depend on unobstructed flyways and migratory routes of our beautiful Iowa skies? Wind farm planners minimize these concerns, seeking to control the debate with promises of quick and easy money-another source of “low-hanging” tax revenue for the county and a way of reducing our dependence on foreign oil. What happens when this “free money” wins out over responsible stewardship of wind, land and wildlife? This is an enormous price to pay for economic gain enjoyed by only a handful of farmers, while their neighbors are doomed to live in the shadow of these hulking, blinking skyscrapers literally “scraping” the beautiful Iowa horizon with turning blades, hundreds of feet long. That “free money” carries a huge price tag. Despite these undesirable consequences, some farmers “bend with the wind” toward the foreign wind farm corporations, enticed by their offers. The promise of “free money” becomes irresistible. And when we give in, we have just answered the question, “Who Owns the Wind?” They do. Until that point in time, no individual owned the wind. Wind was a shared resource that benefited all. No one could claim an exclusive right to it. But now the wind farm corporation has us “all turbined up.” They own the wind. Tragically, they own more than the wind. They own the farmer who has surrendered control of the land. They own the “future” of that land destined to become a gravel road, tons of buried concrete, and towering steel monstrosities held together by nothing more than a “promise” to pay. The farmer has abdicated total control of that piece of land with no reasonable recourse to reclaim it, if and when the “promise” is broken. The wind farm companies did it without Firing a shot. They took control. They expropriated our shared resource that benefited all. Most of us get nothing but a landscape littered with moving, blinking, noisy machines. Gone is our wildlife, gone our rural quiet, gone our peaceful evenings sitting on the deck, gone our unrestricted views of red/orange Iowa sunsets. Gone is our spectacular, unimpeded view of the Milky Way, and our community spirit of solidarity built by generations of farm families; while city dwellers thousands of miles away get cheap electricity without sacri?cing anything. But this isn’t just about giving in to a foreign occupation that has decimated our land, wildlife, skies, horizons and our rural way of life. Perhaps most importantgone is the freedom that comes with full ownership of the land. Gone is the legacy of unencumbered land handed down to us from our ancestors. Gone is the promise of passing this unencumbered land to our children and grandchildren, free and clear. For we now share air space with foreign entities unconcerned with preserving our way of life, which we have just traded for tons of steel, concrete, asphalt, and gravel covering our rich Iowa dirt. “So, how much dough am I going to make on this wind farm deal?” Ironically, our life is diminished in proportion to the lease payment. The greater the payment, the more restricted and smaller our life becomes. The greater the payment, the more power we have ceded to these invaders. The irony of all this centers on power. The farmer loses power, loses the ability to shape the destiny of their farm-to a wind farm corporation. The farmer gives away the power of ownership of land, their birthright. How much is that power worth, the power the farmer just gave away? Can we put a price on it? Is getting “all turbines up” worth it when we abdicate our responsibility to protect a family birthright: the land? Do we really want to give that away? Who owns the wind? Now, they do. And the land. And the farmer. And the close-knit community that raised me. Our tragic loss is their “wind-fall” gain. Their Vegas win. (signed) Wayne R. Knutson, Jr.
Knutson, raised on the family farm in NW Iowa, is a Colonel in the U.S. Air Force. His mother lives on the farm and is involved in managing the operation. His commentary was first published in Wallaces Farmer, August 2016. Guardrails for Niagara Wind- What the hay? Are Niagara Wind’s guardrails being installed for safety of people or just for the protection of wind facility infrastructure? The intrusive and extensive kilometers of guardrails for Niagara Wind now found along West Lincoln’s and Regional roads were a subject of discussion on September 19, 2016. Blocked access to heritage cemeteries, narrowed driveway entrances, visual clutter for home frontages, maintenance issues, and snow removal were among the issues discussed. The random pattern of installations are generating a lot of blow back from the residents who have been calling into West Lincoln County for answers. (Start at the 13 minute mark of the video). Have Questions about Niagara Wind’s Guardrails? Contact West Lincoln public works with inquiries and anticipate the opportunity to be “educated” – Expected timeline for a response to be within 24 hours. Council members (20 minute mark of video) discuss the realities for large modern day farm equipment travelling the roads and increased barriers faced by guardrails narrowing the road width. The suggestion is brought forth that perhaps the Engineers signing off on the plans attend Council and they be reminded to take into account the traffic found in an active agricultural community. Niagara Wind is certainly a moving target.